Although I use Free Software anywhere and everywhere I can, one piece of non-Free software I have really grown to love is Sublime Text 2. 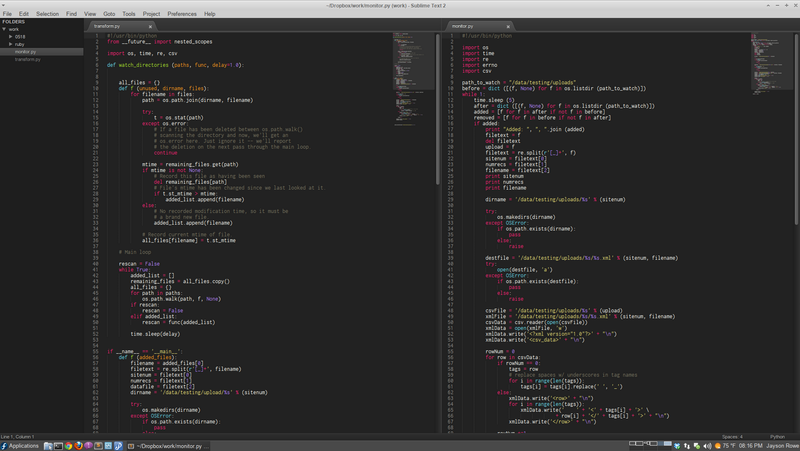 It is simply the best text editor I have ever used, and well worth the ~$60 price tag. One great thing about Sublime 2 is the fast-growing eco-system of plugins that are cropping up, but although not a plugin exactly, I stumbled across a really awesome theme I wanted to share. It's called the Soda Theme, and it's hosted here on Github. 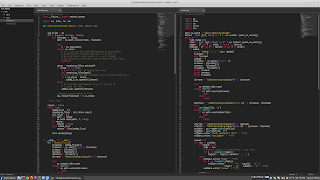 If you happen to use Sublime Text 2, I highly recommend you check it out. 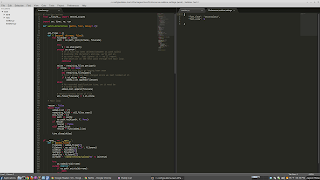 It has both a 'dark' and 'light' variant, along w/ syntax highlighting schemes to match each of them. I'm using the 'dark' (because I prefer light text on a dark background) and it melds *perfectly* with the Greybird XFCE GTK and Window Manager theme. Since Blogger tends to scale down images, here is a full-resolution version in all it's glory. If you are interested, I use Inconsolata in 9pt for my font. The Github page has full instructions on installing the theme. If you've never tried Sublime Text 2, and want to try it out, here is a nice guide for installing on Fedora. I've modified those instructions personally, as I have a folder in my home directory called ~/.bin where I store 'out of repo' or 'extract and run' executables and such, but you should be able to follow what he is saying to get all the proper symlinks and .desktop files set up so it will integrate in your menu system and everything. And just like before, here is a full-resolution version for you. The biggest (most obvious) difference is the side-bar, but the area around the tabs looks nicer in the Dark Soda theme, and it all integrates w/ the Syntax theme provided. I <3 sublime, it's quickly become one of my favorite tools. Ardian - I added a screenshot of the default theme so you could see the difference.